Lunula amulet is found in several mythologies of the ancient European peoples. It is designed to protect the better half of humanity, helping in childbirth, in combating women's ailments (infertility, etc.). In the era of the ancient Romans such an amulet was worn by teenage girls before the wedding, and then burned along with other children's things to symbolize entering the adult stage of life. Even after getting married, the women continued to wear the ring with feathers, which, as well as the Lunula pendant was designed to protect the delicate feminine. Here you will find a magnificent replica of the Lunula Pendant Silver and yellow gold. The product consists of a crescent covered with ornament, the ends of which are held by a graceful female body. The crescent is engraved with floral runes that provide a connection to the higher powers, and the protection of the gods. This floral pattern can also be found on the Viking axe from Mammen village, which was used for ritual purposes. Lunula Pendant makes a great gift for girls and women who need protection. It will help to defend the feminine beginning and fertility, protect against illnesses, evil eye and curses. 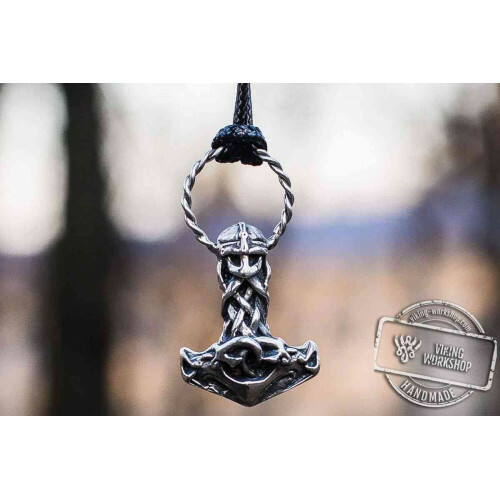 Viking-workshop online store offers its customers a special Lunula Pendant amulet, created by artisanal methods. All manufacturing processes (melting, grinding, etching, etc.) are carried manually by our experienced craftsmen. When ordering the Lunula Pendant, you can be sure that there is no other one like it anywhere in the world, and therefore, your gift will be the most unique and special.